I wanted to start this blog by saying that Summer is the best time to visit Dahlonega, but then I got to thinking; there actually is never a bad time to visit Dahlonega. 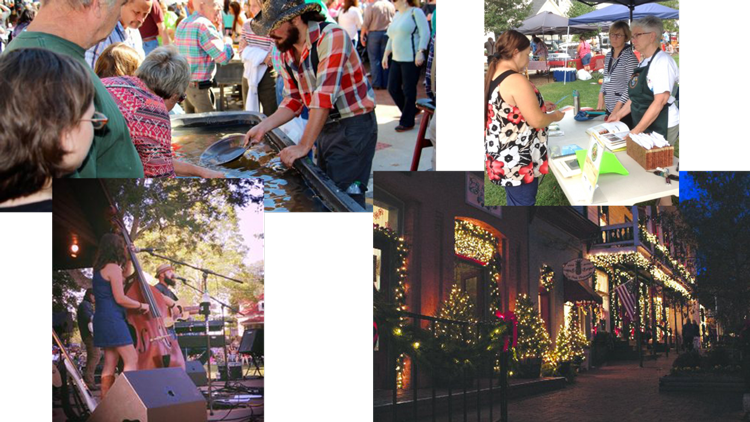 Whether it’s a fall festival, an olde-time winter Christmas, a spring farmer’s market or summer movies under the stars and concerts in the park, there are always fun, family-friendly things going on in Dahlonega. All these fun and unique opportunities coupled with the beautiful landscape (Dahlonega, for those of you who haven’t had a chance to visit yet, is a town nestled in the foothills of the Appalachian mountains) makes it a great destination for any time of year. Surely at this point you are checking your calendar trying to figure out how soon you can get to Dahlonega, and you will probably need a place to stay. Don’t fret! We have you covered on that one. From Bed and Breakfasts, to Inns, Hostels, Airbnb’s and the more traditional hotel-style lodging, Dahlonega has a little bit of everything and each with its own charm. 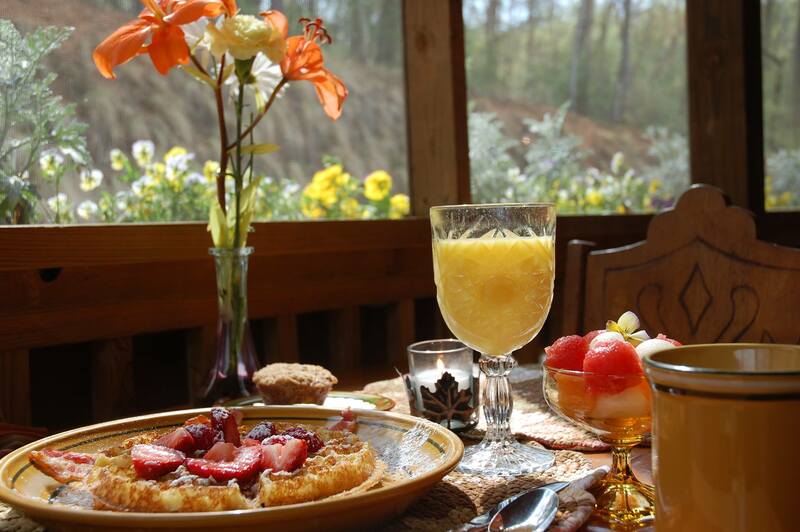 If Bed and Breakfasts are your cup of tea, or if you have no “cup of tea” but would like one (served to you for free just feet from your bedroom) then Dahlonega has some great places to stay for you! 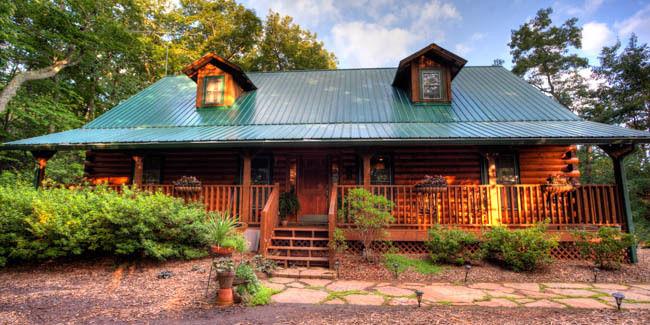 Long Mountain Lodge is just off Camp Wahsega road just 7 miles from the downtown Dahlonega square. The lodge offers stunning views of the surrounding mountains and the breakfast “lighter than air” waffles can not be beat. The lodge offers guided nature walks on the premises, fishing, a gift shop and rare book shop, afternoon appetizers and made-from-scratch cookies for all guests. As are most things in Dahlonega, the lodge is family-owned and operated, making your stay feel more like visiting friends than staying at a hotel in an unfamiliar place. If the lodge and awesome breakfast don’t sound appealing to you and you’re thinking “I wish I could just stay in a cabin next to a waterfall”, book with Long Mountain Lodge! The Lodge also owns a property at Camp Glisson, just minutes down the road from the Bed and Breakfast known as the Waterfall Cottage. 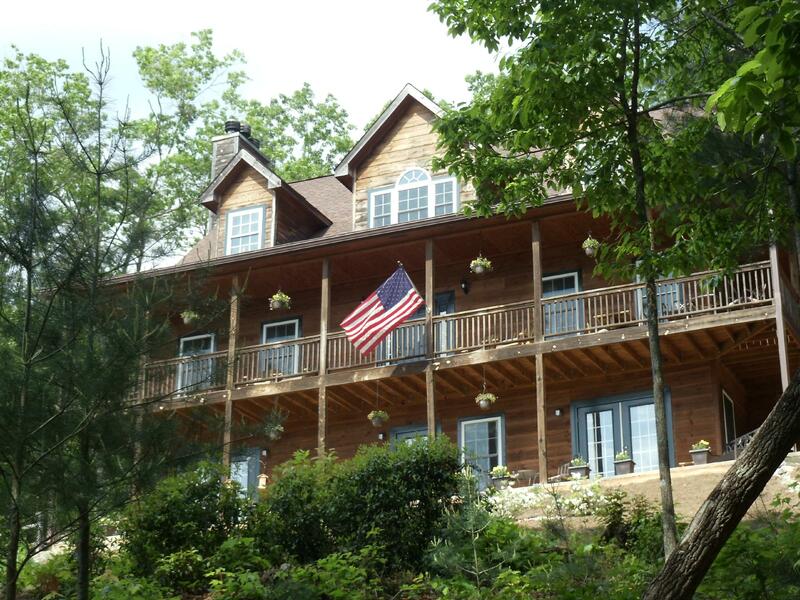 The cottage has two bedrooms with queen sized beds in each, a wood-burning fireplace, a private entry with a deck and a view of the waterfall on Cane Creek. Though camp is in session during the summer months, this is still secluded enough from camp activity that a stay would not be ruined by noise from the campers. The times, they are a-changing. Technology seems to have created a way for everyone to provide the services they see a need for; if you have a car, be an Uber driver, if you have a house, put it on Airbnb! Even though Dahlonega may only have one Uber, we are not lacking in the Airbnb department! Our Airbnb choice is a small cabin in the woods that captures all the things we love about living in the mountains; wood-burning stove, loft bedrooms, and skylights for stargazing. 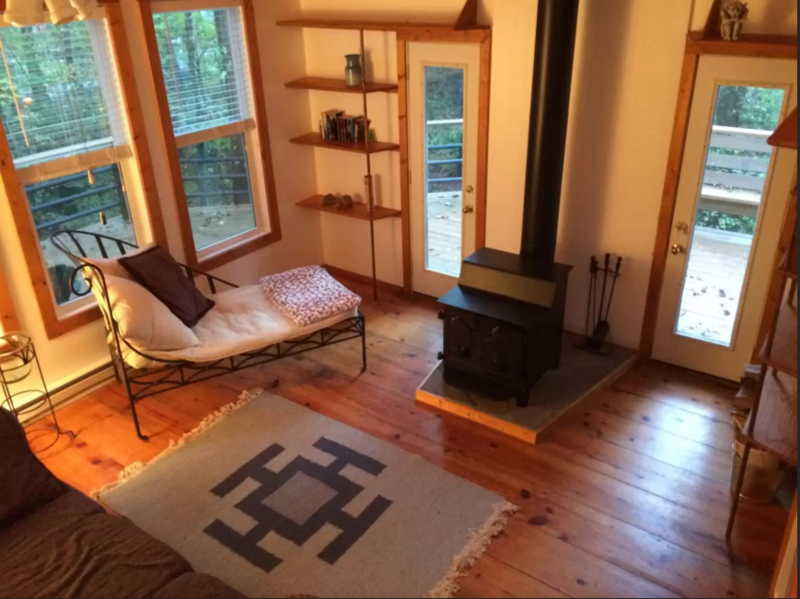 Dubbed “The one near all the wineries” by Wander North Georgia, this small 1 bedroom cabin makes a stay in Dahlonega feel like you’re home for the weekend. It’s just a bonus that it happens to be just 2 miles away from 3 different wineries. If you like to go the more traditional route and stay in a hotel, Dahlonega has options so close to the square that you could look out your window and spit on it (though we don’t advise doing that). Below are a few of our favorites for right-in-town lodging. Though the smith house is technically a hotel, the exterior paired with the rocking chair-lined porch make it feel more like home. 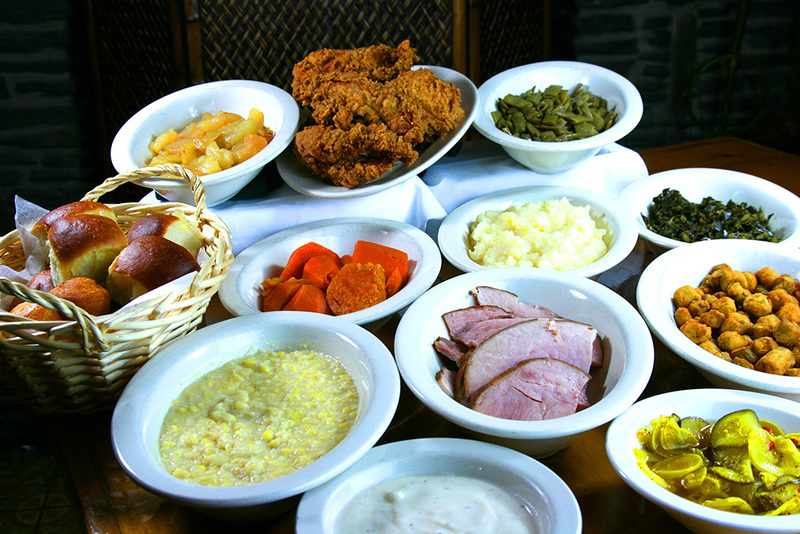 Not only are the rooms spacious and beautiful, but the food is incredible if you like good old southern cooking (and served family-style which adds to the feeling of being home). 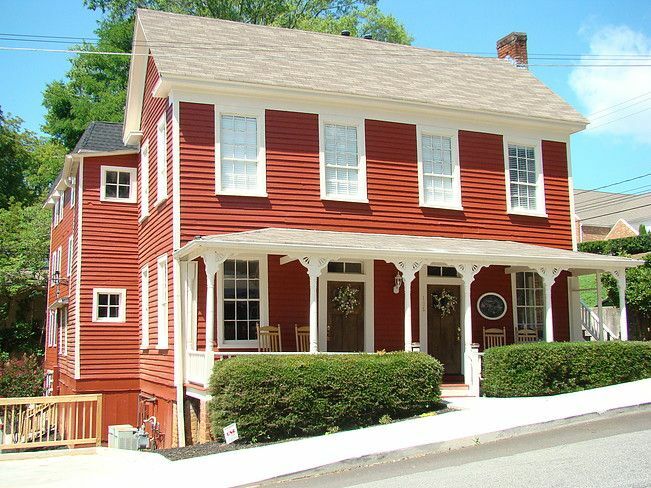 At just two blocks from the Dahlonega square, it’s hard to beat a stay at the Smith House. Not only does The Smith House offer lodging and fine southern dining, but it is also home to one of the oldest mining shafts in Dahlonega which is open to the public view in the basement of The Smith House. Once you get a taste for the history hidden in the walls and floors of The Smith House, you’ll want to check out Consolidated Gold Mine for more information about the history of the gold rush, get a tour of one of the mines, and even mine for gold yourself! If you want to be right in the center of the action, with a room right on the Dahlonega square, come stay at Park Place Hotel. Zero blocks from the downtown square (because it sits on the square) Park Place Hotel is a great place to be for those busy days in Dahlonega when parking can be difficult to find. Complete with a huge patio area and fire pit, this is a perfect spot to hang out outside at night, watching fireflies and being earshot from any of the live music venues in town. The Dahlonega Square Hotel and Villas are another option for those who want to be a stone’s throw from the central hub of the square. At only one block from the downtown area, a stay in this hotel (or villas) this location is just about as central as it gets in Dahlonega. Local shops and restaurants are within walking distance to both the hotel and villas. 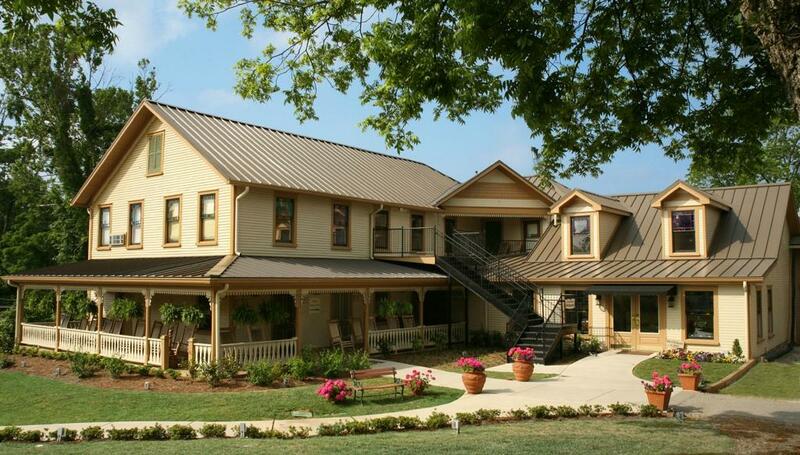 The McGuire House is the “Hotel” in the Dahlonega Square Hotel and Villas and offers an event space as well as 6 King rooms and 6 Double Queen rooms each with a private bath with walk-in shower, desk, 32-inch TV, coffee maker, iron, ironing board and hair dryer. The villas offer more of a home away from home option, the villas offer full kitchens and separate living and sleeping spaces for guests looking to make Dahlonega feel a little more like home for the duration of their stay. Some of you will be drawn to Dahlonega for the outdoor recreation that the Blue Ridge Mountains have to offer; and we haven’t forgotten about you. The Hiker Hostel is just outside of Dahlonega and is a hub for outdoor enthusiasts year-round. Whether you prefer mountain or road biking, day hiking or extended trip backpacking, or just space to breathe in some fresh mountain air; hiker hostel is where you’ll want to book. With a combination of bunk-style and private rooms as well as the option to rent out other cabins on-site you’ll have the option to get cozy with your fellow travelers or have some space to yourself. The hostel also offers a shuttle service to the trailheads in the area and parking at the hostel is free! With so many reasons to visit Dahlonega, and now so many options for where to stay when you do, nothing is stopping you from making Dahlonega the destination for your next get-a-way! Click any of the links above and make your reservations, we look forward to exploring with you!